The sensory dome encourages your baby to move around, pick things up and use their imagination to play, allowing them to develop motor skills and strengthen up as they go along. The sensory dome encourages your baby to move around, pick things up and use their imagination to play, allowing them to develop motor skills and strengthen up as they go along. Teach them the names of all the animals and the colours of the balls and beanbags, and improve social and conversation skills by playing together. One side of the sensory dome has cut-out holes to post the four coloured playballs through and play peek-a-boo. The other side of the dome allows your child to feed the animals with the apple, banana and leaf crinkle bean bags. There is also a fold down mat with squeaker and crinkly sounds. So much to explore Encourage your baby to feel the textures on the floor, peep through the windows to see what’s outside, and look into the sun mirror to see a beautiful baby! 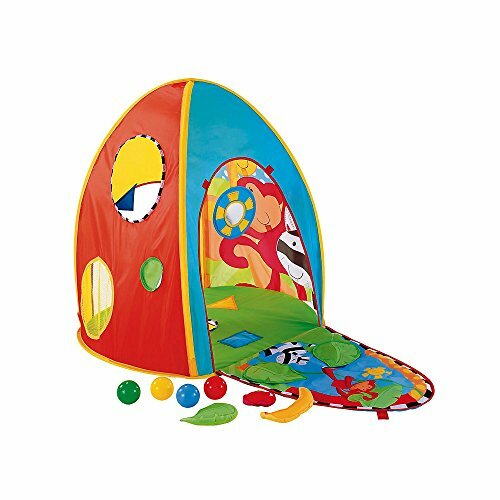 Enjoying active fun Play crawling games with your baby around the dome, show your baby how to post the balls through the holes, and ‘feed’ the animals with the play fruit by using the sticky Velcro on their mouths. Great for Sitting, crawling, rolling and exploring Encouraging reaching, posting and fetching Playing with your baby Inspiring your baby to move and discover more Posting in balls and ‘feeding’ the animals Inventing fun games together Little fingers to explore and enjoy Includes sensory dome, 4 playballs and 3 beanbags.